All items on this list are currently in stock ready for immediate delivery. and american express credit cards. NOTE: Send us an email if you would like a button added to a specific item. APTEC ELECTRONICS . . .
HEWLETT-PACKARD Item Description US $ . .
HP scope probes Some HP probes have moved here . . .
HP 104AR quartz oscillator (con. unk.) call SOLD . 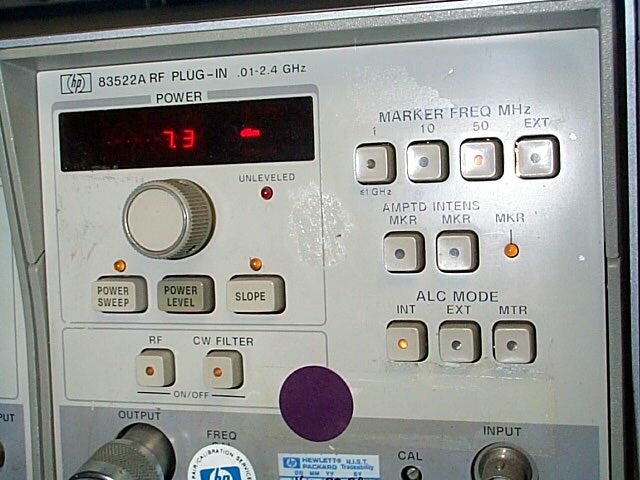 HP 10514A mixer .2-500 MHz 250 . HP 10514A opt H26 mixer .2-500 MHz 250 . HP 10528A LOGIC CLIP 100 . HP 10603A extender for 5431A 175 . HP 10833x HPIB cables have moved -here- . . .
HP 11042A probe t connector (see HP455A) 275 sold. .
HP 11050A 1 volt thermal converter 650 sold . HP 113BR frequency divider and clock (cond. unk.) call ctn3fg106d . HP 115BR frequency divider and clock (cond. unk.) call ctn3fg106d . HP 11518A 12.4 - 18 GHz taper section 2ea 199 . HP 11519A 18 - 26.5 GHz taper section 250 . HP 11549A power divider 375 . HP 11581A opt 890 w/box Type N attenuator set w/original HP cal sheets 3, 6, 10, 20 dB 650 . HP 11636A power splitter DC-18 GHz 649 . HP 11691D opt 001 2- 18 GHz 22 dB nom. directional coupler 449 1. HP 11691D opt 005 2- 18 GHz 22 dB nom. directional coupler APC-7 all ports 449 1. HP 11693A Limiter N (f/m) 449 1. HP 1330A xy display 450 . HP 141T MAINFRAME 500 SOLD . HP 16064A see hp-4277A call . .
HP 1630D logic analyzer w/5 pods 550 . .
hp 16500A Logic analyzer see various boards avail. HERE 999 . .
hp 16500B Logic analyzer color mainframe (2) 599 DD4 . hp 1650A Logic analyzer 525 pallet23 . hp 1651A Logic analyzer 525 . .
hp 165XX see HP parts for boards HERE call . .
hp 1651B Logic analyzer 999 . .
hp 1660A 136 ch 100 MHz state/500 MHz timing Logic analyzer call for avail. rfl . hp 16700A opt 003 Logic analyzer call for avail. 132N . hp 1671G Logic analyzer (with all pods) 7499 AA3R . 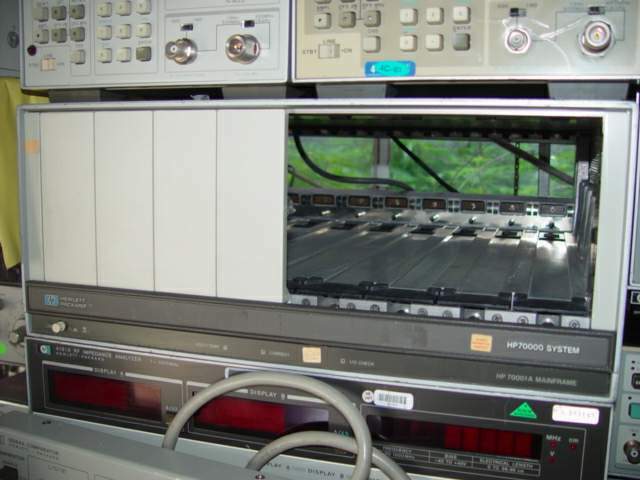 hp 1741A storage 100 MHz oscilloscope (rack mounted) 300 aa5 . hp 18180A interface (see 4951C) call . .
HP 197B camera 250 . HP 204D audio oscillator 274 . .
HP 214B pulse generator call for avail 1250 sold . HP 2225A THINK JET GPIB 110v used call . .
hp 3235 switch/test unit control panel 749 aa1 . hp 3245A universal source 3400 . HP 33000D pin absorptive modulator 200 . HP 3310A function generator 375 ctn . HP 33120A 0-15 MHz function / arbitrary waveform generator 1350 . .
HP 3325A synthesizer / function generator SPECIAL 500 . .
HP 3325A opt 001 synthesizer / function generator with high stability 650 . .
HP 3325A opt 001, 002 synthesizer / function generator with high voltage output and high stability 850 . .
HP 3325A opt 002 synthesizer / function generator with high voltage output 750 . .
HP 3325B no opt image- synthesizer / function generator 750 in stock now . HP 3325B opt 001, 002 -image- synthesizer / function generator with high voltage output & high stability time base 1250 in stock now . HP 333XX* series switches RF Switches have moved -here- call . .
HP 333XX series attenuators have moved -here- 375 . .
HP 3335A synthesizer / level generator SOLD sold . HP 3336B opt 01, 05 synthesizer / level generator (may need repair) call DD4T . HP 339 distortion measurement system 900 . .
HP 340A-16A noise tube cable SOLD . .
HP 3421A acquisition unit- opt 201 (GPIB) options see 44462A & 65A 494 call for avail. .
HP 3421A acquisition unit- opt 020 & HPIL & GPIB 620 ctn . HP 3421A acquisition unit w/ 3 ea. 44462A with 44463A con. blocks GPIB, HPIL 650 DD8 . HP 3421A acquisition unit- mainframe only 349 ctn call for availability . HP 3434A DIGITAL Multimeter GPIB call for availability 250 4 . HP 34401A MULTIMETER. 999 in stock . HP 3455A MULTIMETER. 329 qty . 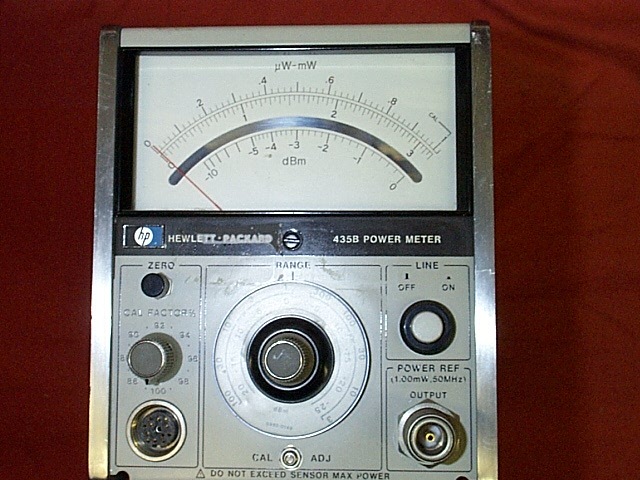 HP 3456A MULTIMETER. 349 qty . HP 3465A MULTIMETER. (as-is) 300 . .
HP 3466A MULTIMETER. 300 . .
HP 3476B multimeter 349 . .
HP 3488A + opt 014 switch / control unit + HP44474A 16 bit dio 1250 . .
HP 3495A scanner (with 4 cards) 750 call for avail . HP 34970A opt 001 data acquisition / switch unit (001= less DVM) 649 2+ . HP 3497A scanner 750 . .
HP 353A patch panel (untested) 275 aa4 . 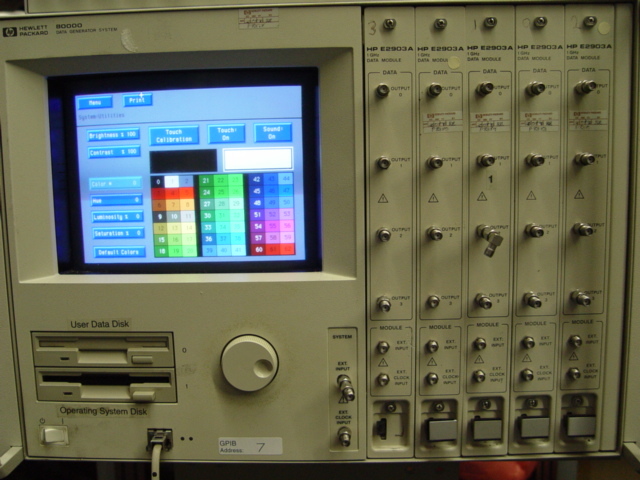 HP 3561A opt 001 Dynamic Signal Analyzer, 125 uHz to 100 kHz -image- 1550 1 . 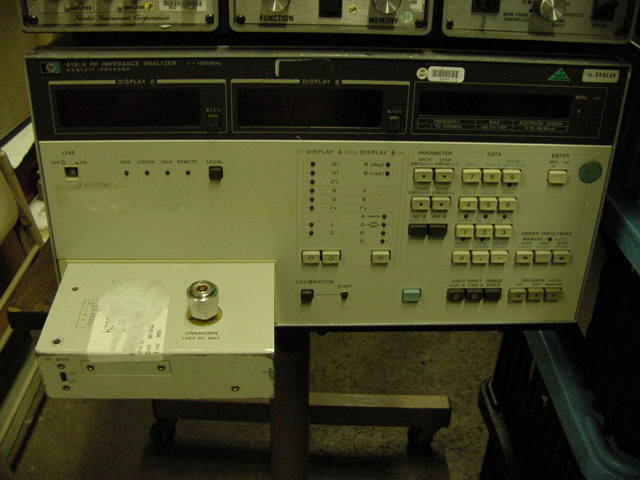 HP 35677A s parameter test set 100Khz - 200 MHz 749 1RFL . HP 3581A opt H10 wave analyzer 794 aa4 . 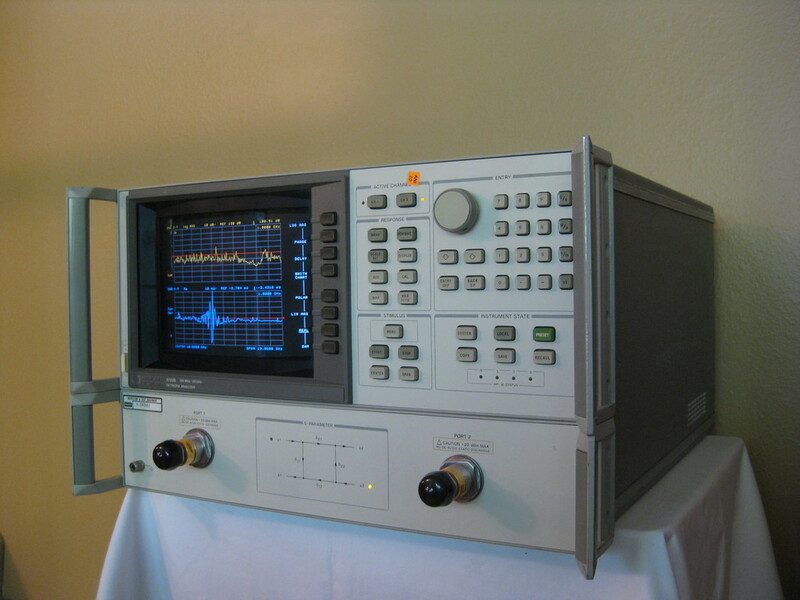 HP 3582A spectrum analyzer .02Hz-25.6 KHz SALE! 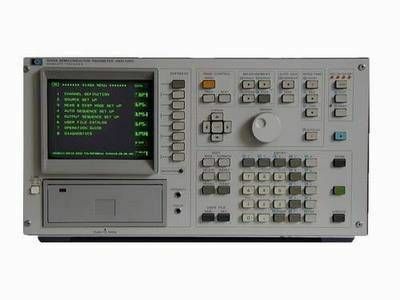 1250 .. .
HP 3585A spectrum analyzer 20 Hz-40 MHz SALE! -picture- CHEAP! 2500 . .
HP 3586C selective level meter SPECIAL 674 DD5 rfl . HP 3586C opt 04 selective level meter SPECIAL 674 rfl . 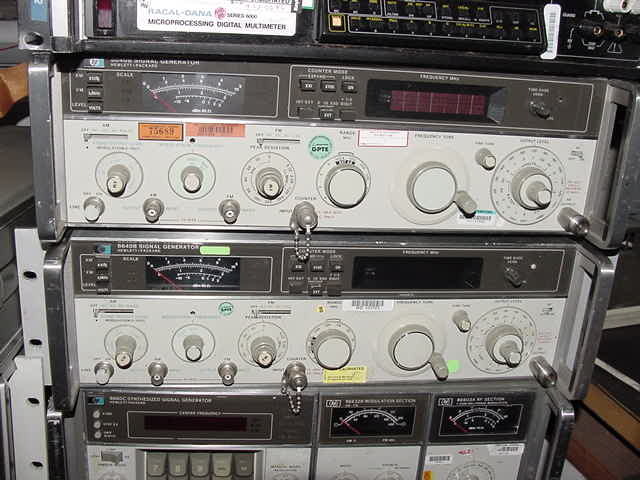 HP 3708A noise & interference test set 4550 DD4T . HP 37702A digital data tester call - . HP 3852A digital acquisition/control units call qty . HP 403B AC VOLTMETER 149 . .
HP 410C VOLTMETER call SOLD . HP 4140B picoammeter / voltage source GPIB 1999 DD9 . 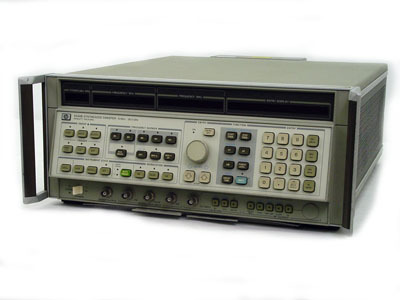 HP 4145A semiconductor parameter analyzer -picture- lowest price on the web! 3999 SOLD . HP 4191A rf impedance analyzer picture low price 2199 DD5 . 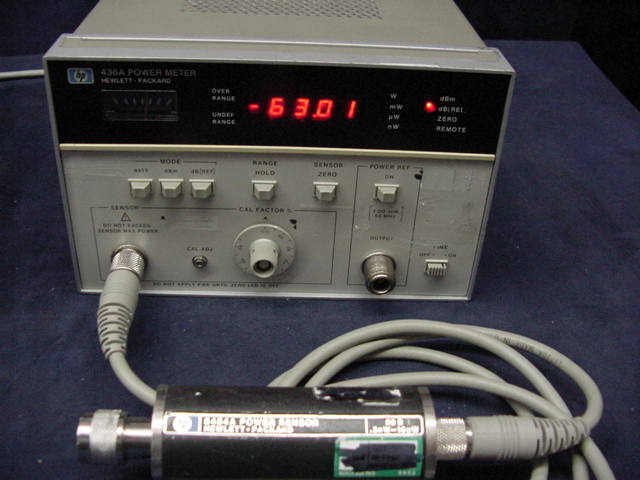 HP 4192A LF Impedance Analyzer. 5 Hz to 13 MHz 3250 IN STOCK NOW . 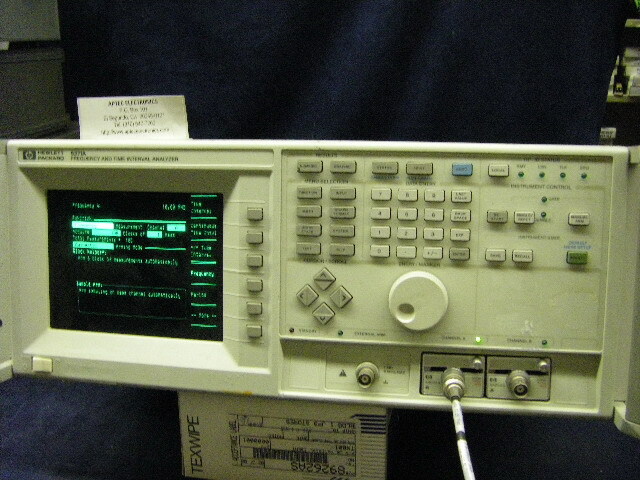 HP 4195A opt 001 network / spectrum analyzer with measurement unit -image- 7295 SOLD . HP 42XX detectors -click here- . . .
HP 4275A Multi-Frequency LCR Meter 10kHz to 10MHz test frequencies, 1mV to 1Vrms test signal level, 0.1% basic accuracy, 5.5 digit high resolution, D=0.00001, Measures EL/C - D/Q/ESR/G R - X/B/L/C DELTA%, LED display. 2849 . .
HP 4277A LCZ Meter (w/16064A) 2390 DD4T . HP 43114A digital delay generator call dd3 . HP 4328A MILLIOHM Meter ( no leads) 895 SOLD . HP 4328A MILLIOHM Meter (with leads) 999 SOLD . HP 4328A opt 001 MILLIOHM Meter (with leads) 1049 SOLD . 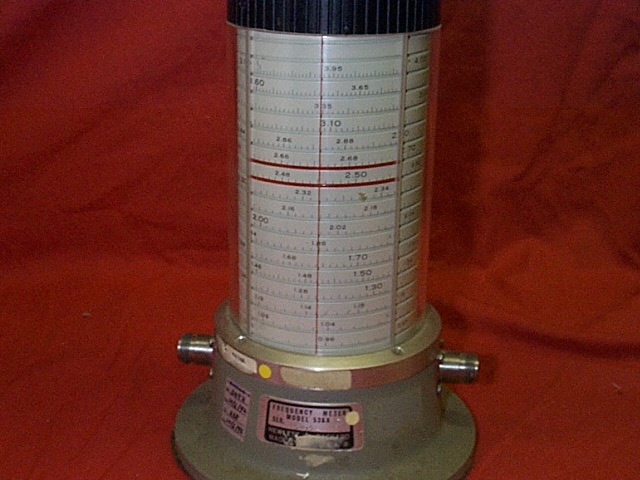 HP 4342A Q-Meter 1450 SOLD . HP 435A rf POWER METER SALE! 125 out of stock . HP 4437A Attenuator 600 ohms DC-1MHz 1W 150 sold . HP 455A PROBE-T- connection 275 2 ea . HP 456A a.c. current PROBE- 175 . .
HP 465A amplifier 324 SOLD . HP 467A amplifier (broken binding post) 339 SOLD . HP 478A detectors and power sensors have moved here . . .
HP 486A THERMISTOR 150 . .
HP 4904A cable fault locator kit w/4994 receiver 500 . .
HP 4912F fault locator 250 . .
HP 4935A transmission test set (as-is call) 250 . .
HP 4940A transmission impairment meas. set 500 SOLD . 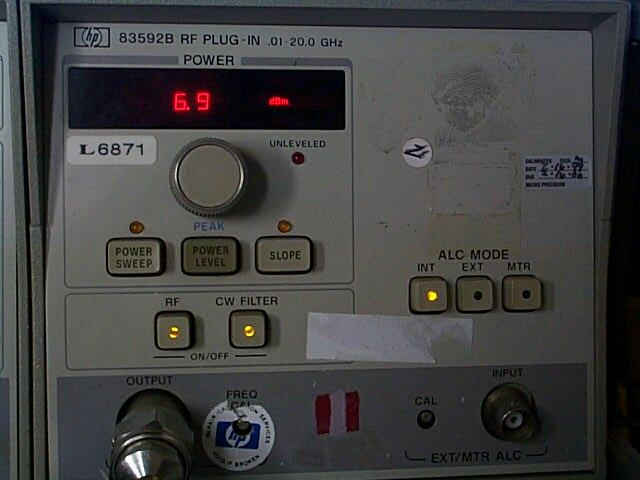 protocall analyzer (w/18180A) call . SOLD . 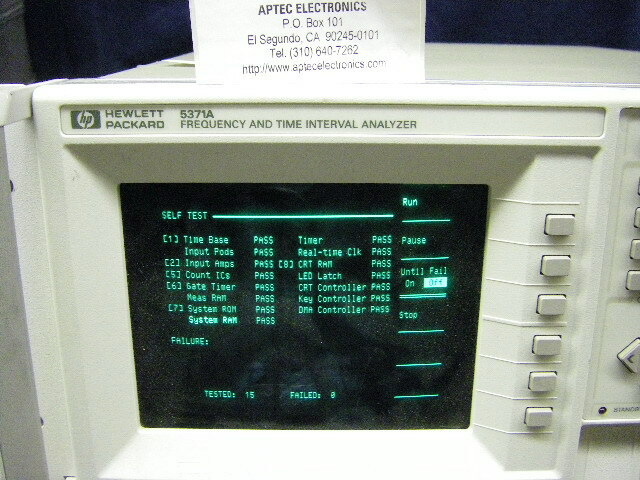 HP 4952A protocall analyzer 850 . SOLD . HP 4954A protocal analyzer 550 SOLD ..
HP 4957A protocal analyzer call . SOLD . HP 5004A SIGNATURE .analyzer 250 off . HP 5316B opt. 001 Universal Counter 1 Hz - 100 MHz 5316B Universal Counter 450 refurb. HP 5328A opt 10, 21, 40 Ch C 512 MHz counter... 625 DD6 . HP 5328A opt 10, 21, 41 Ch C 512 MHz counter... 625 DD6 . HP 5352B 40 GHz frequency counter call . .
HP 537A 3.7 - 12.4 GHz. coax freq. meter 175 . HP 5370A UNIVERSAL counter parts unit SOLD . HP 5370B UNIVERSAL counter 989 SOLD . 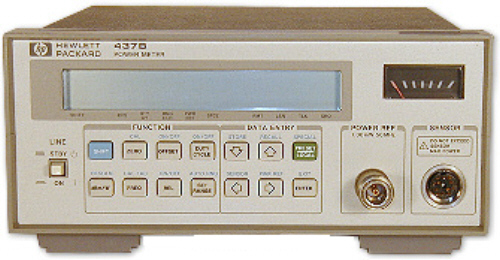 HP 5371A frequency and time interval analyzer -image- 1500 call for avail. 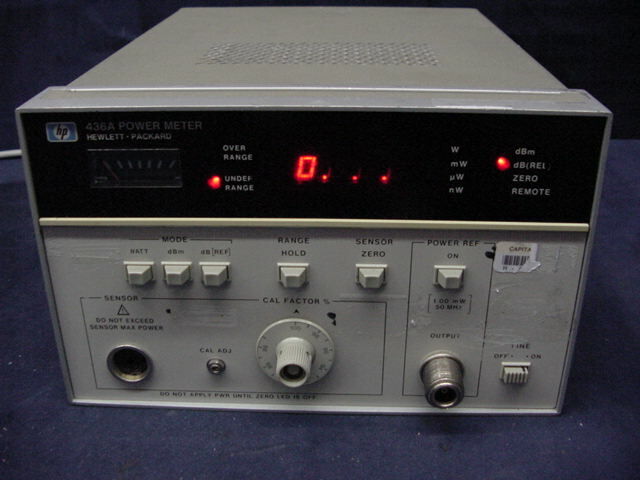 HP 5373A modulation domain analyzer 1950 SOLD . HP 5385A 1 GHz counter 750 refurb AA1 . HP 54110D digitizing oscilloscope COLOR -image- -image- 850 SOLD . HP 54112D digitizing oscilloscope COLOR 1200 SOLD . HP 54114A 2 giga-sample/s test set (in box w/ sma cables) 550 hp10 SOLD? . HP 54114A 2 giga-sample/s test set kit 500 . SOLD . HP 54120B w/ hp 54121A digitizing oscilloscope COLOR with 4 ch. 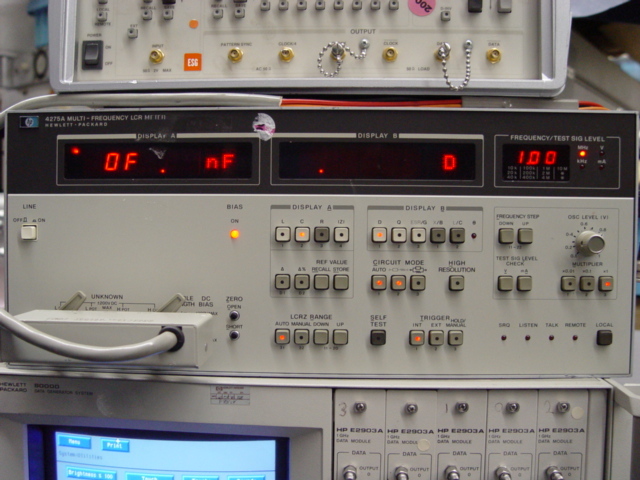 dc - 20 GHz test set 2499 . SOLD . HP 54200A digitizing 'scope 894 ctn. SOLD . HP 54200D logic trig. digitizing 'scope 795 . SOLD . HP 54502A 400 MHz digitizing 'scope (crt burned) AS-IS 250 . SOLD . 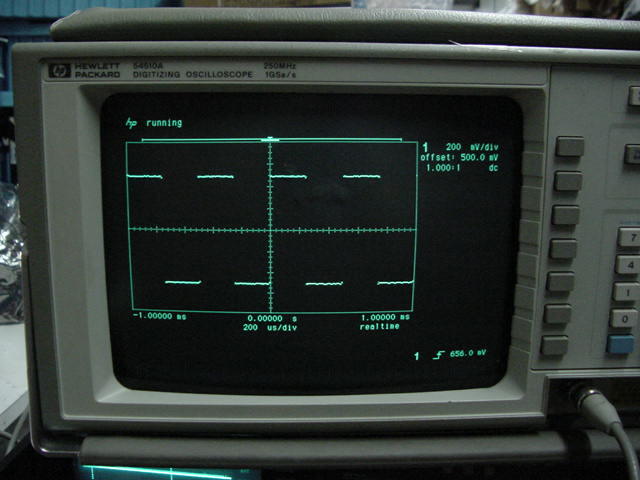 HP 54510A 250 MHz 1 Gsa/s digitizing o'scope w/ 500 . SOLD . HP 54520A 500 MHz digitizing 'scope 500 .bb2 SOLD . HP 54542C 500 MHz 4 ch 2GSa/s color (may need repair) call . SOLD . HP 54616C 500 MHz 2GSa/s color 2994 SOLD WChou . HP 5503C True Root Mean Square DVM 500 . SOLD . mount for HP 5500C series 1328 (base mount only) 100 SOLD . 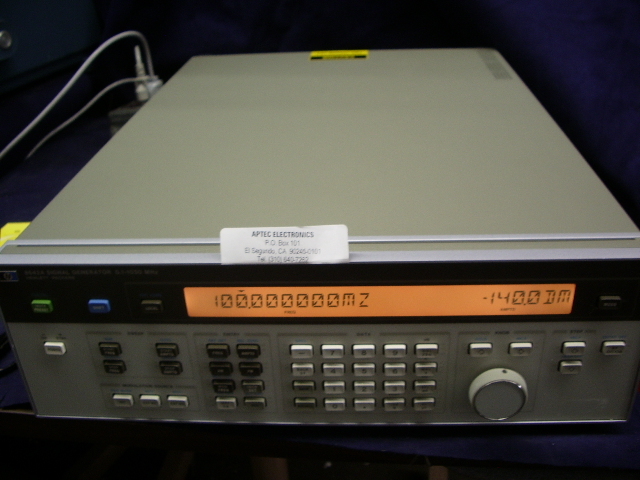 HP 58503A opt AWQ Time and Frequency reference receiver (24 volt) -image- 2850 1. 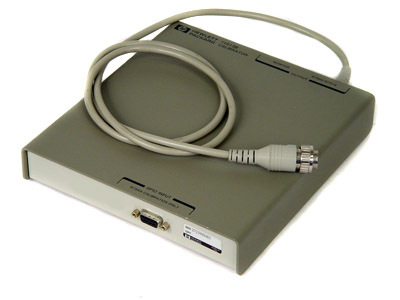 HP 58503B Time and Frequency reference receiver -image- -manual- 3400 1. HP 59308A Timing Generator 450 132N . HP 59401A bus system analyzer refurbished 450 WH . HP 59501A HPIB D/A /power supply programmer 150 . HP 59501B HPIB D/A /power supply programmer (now in stock) 175 . HP 608A-96A Fuse holder - coaxial 75 1. SOLD . HP 61011A relay multiplexer 150 . SOLD . - more power supplies here more power supplies here . . .
HP 66000A MPU Mainframe rack mount 999 SOLD . HP 66001A MPS Keyboard (sold with 66000A only) 399 AA1 SOLD . HP 6942A multi programmer call .SOLD . HP 69701A resistance output for 6942A 100 aa1d . HP 70001A mainframe picture 350 SOLD . HP 70004A mainframe 650 i SOLD . HP 70300A tracking generator 2.9GHz call SOLD . HP 7035B Plotter call AA2R SOLD . HP 70611A switch / attenuator driver 250 1 SOLD . HP 70611A opt. 001 switch / attenuator driver 250 1 SOLD . HP 70900A Local Oscillator 3.0 GHz to 6.6 GHz Plug-in 1500 2 SOLD . HP 70900B Local Oscillator Plug-in 3000 1 SOLD . HP 70902A IF Section -image- call SOLD . HP 70903A IF Section -image- call SOLD . 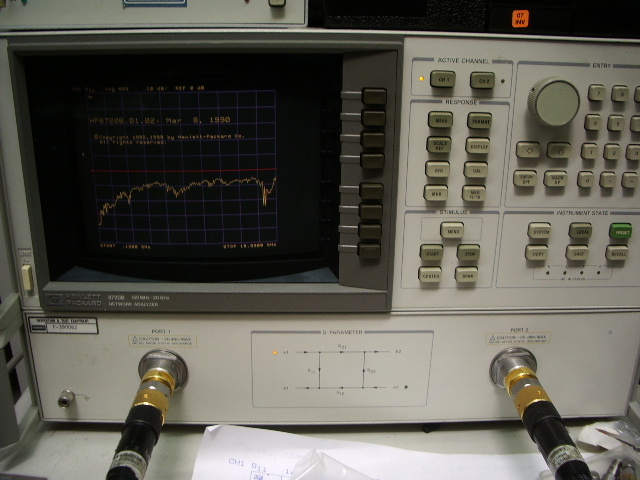 HP 70904A 50 kHz - 22 GHz RF Section call SOLD . HP 70905A 50 kHz - 22 GHz RF Section 2500 SOLD . HP 7155B recorder w/ lid 450 . SOLD . 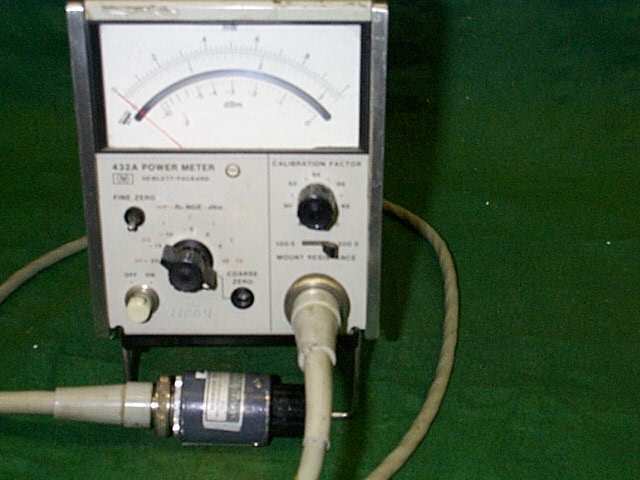 HP 738BR voltmeter calibrator (con. unk.) call ctn3fg106d . HP 7475A -001 6-pen SERIAL Plotter refurb 250 wh. HP 7475A -002 6-pen GPIB Plotter (refurb.) 300 . 75000 series B E1301A VXI mainframe 500 SOLD . 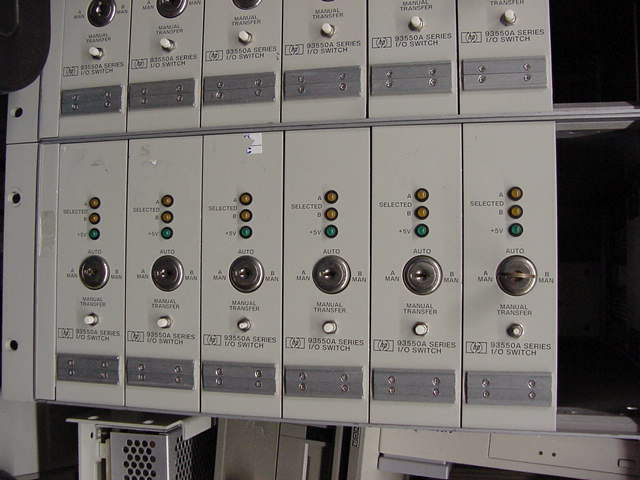 75000 series C E1400B High power VXI mainframe (see others below) 750 . SOLD . HP 7550A 8-pen plotter (refurb) 725 eb SOLD . HP 8003 PULSE generator (2) 150 ctn . call - in stock now! . .
HP 8005B PULSE generator 399 . .
HP 8011A PULSE generator call . .
HP 8012B pulse generator 200 Wrefurb AA3 . 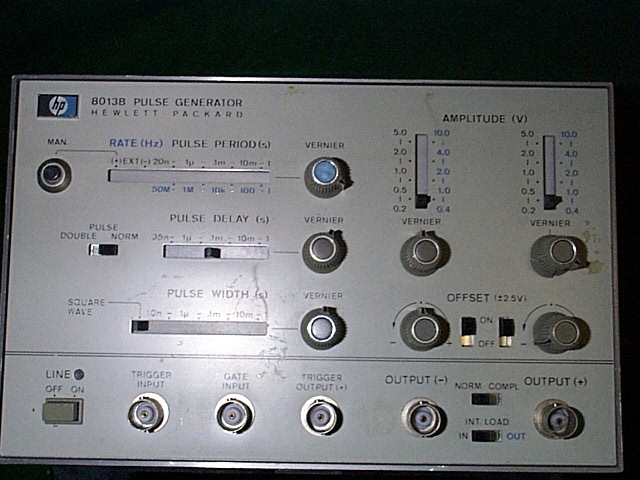 HP 8013B pulse generator 550 . .
HP 8015A pulse generator repair? CALL . .
HP 8015A opt 002 pulse generator 550 SOLD . HP 8016A opt 001, H02 WORD Generator 400 SOLD . 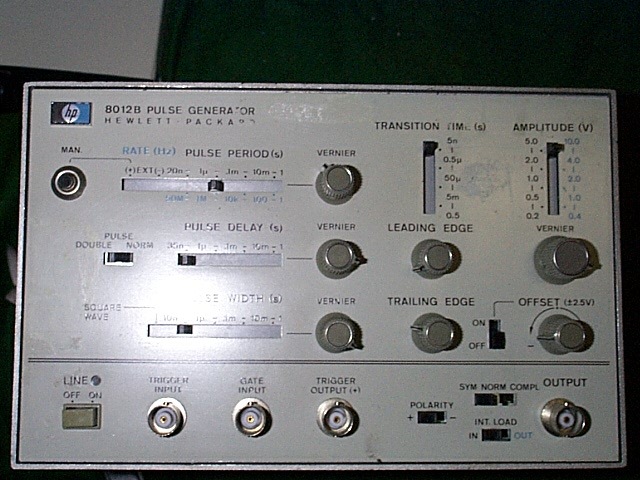 HP 8080A -81A -83A -84A pulse generator 1550 SOLD. .
HP 8111A pulse / function generator 20 MHz 888 in stock now, refurb. HP 8131A opt 020 500 MHz pulse generator (damaged-works) 9500 . SOLD . HP 8165A prog. signal source 1mHz-50MHz 749 DD4 (2) call for avail. .
HP 8165A opt 002 prog. 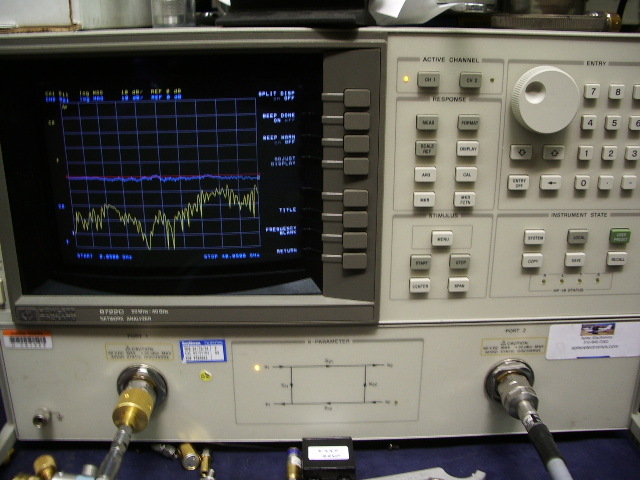 signal source 1mHz-50MHz (parts unit) 449 SOLD . HP 8175A Digital signal generator (tested OK, pods included) 1049 132N in stock now! HP 8350A sweeper mainframe 500 1 . HP 83550A 8 - 20 GHz sweeper plug-in 3499 call for avail. .
HP 83572C 26.5 - 40 GHz sweeper plug-in SOLD . .
HP 83592B .01-20 GHz sweeper plug-in 3999 call for avail. .
HP 83592B opt 002 .01-20 GHz sweeper plug-in-image- 3999 . .
HP 83592C .01-20 GHz sweeper plug-in high power 3999 . .
HP 83594A 2-26.5 GHz sweeper plug-in 4499 . .
HP 8405A vector voltmeter 250 .as-is . HP 8405A KIT 11536A (2), 11549A, 908A (2), short, accessory kit 650 call for avail . HP 8410A network analyzer 325 sold . HP 8411A harmonic freq. converter 12 GHz 325 in stock . HP 8411A opt 018 harmonic freq. converter 18 GHz 450 in stock . HP 8413A phase gain display - 300 sold . HP 8444A tracking generator (parts missing) 200 sold . HP 8445A automatic tracking pre-selector 375 sold . HP 8470A crystal detector apc-7 250 . .
HP 8472 series detectors detectors have moved here call . .
HP 8477A power meter calibrator 549 aa3 . HP 848x series sensors detectors and power sensors have moved here . . .
HP 85023A APC-7 verification kit box 450 . HP 853A mainframe 999 aa1 . HP 8542A accessory kit (incomplete?) 500 ab1 . HP 8552A I F Plug-in for 141T 500 hpsoldvm1p9 . HP 8552B I F Plug-in for 141T call .sold . HP 8552B-H77 I F Plug-in for 141T 500 .sold . HP 8554A 1200 MHz RF section for 141T 950 hpsoldvm1p9 . HP 8556A LF SECTION 20Hz-300KHz 450 sold . 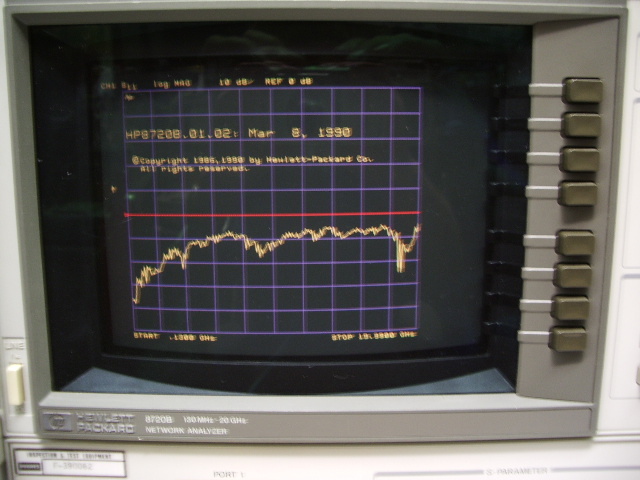 HP 8557A 350 MHz spectrum analyzer 949 .sold . 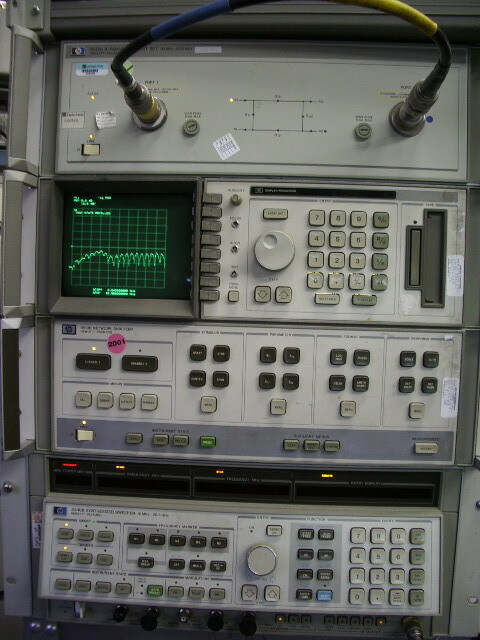 HP 8569B 22 GHz spectrum analyzer 3499 1 . HP 8591E 010, 140, 004, 130 1.8 GHz portable spectrum analyzer (with EMI options) 7999 1 in stock now. HP 8620C SWEEPER 449 BYT . HP 8621A /86331/86320A 0.1-2 & 1.7-4.3 GHz plug-in. 500 sold . HP 86242D 5.9-9 GHz plug-in *call for avail* *400 hpvm1p7&8 . HP 86250D 8-12.4 GHz plug-in *call for avail* *450 hpvm1p7&8 . HP 8640B SIGNAL Generator 1000 .call for availability . HP 8640B opt. 004 SIGNAL Generator Avionics opt.004 2500 .sold . HP 8642A opt. 001, 002 SIGNAL Generator 100 KHz - 1057 MHz 2000 in stock . HP 8642A opt. 004 SIGNAL generator (call for avail.) call . .
HP 8642A opt. 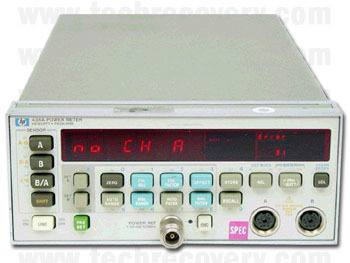 002 SIGNAL generator 100 KHz - 1057 MHz (like new) -image- 2000 in stock . 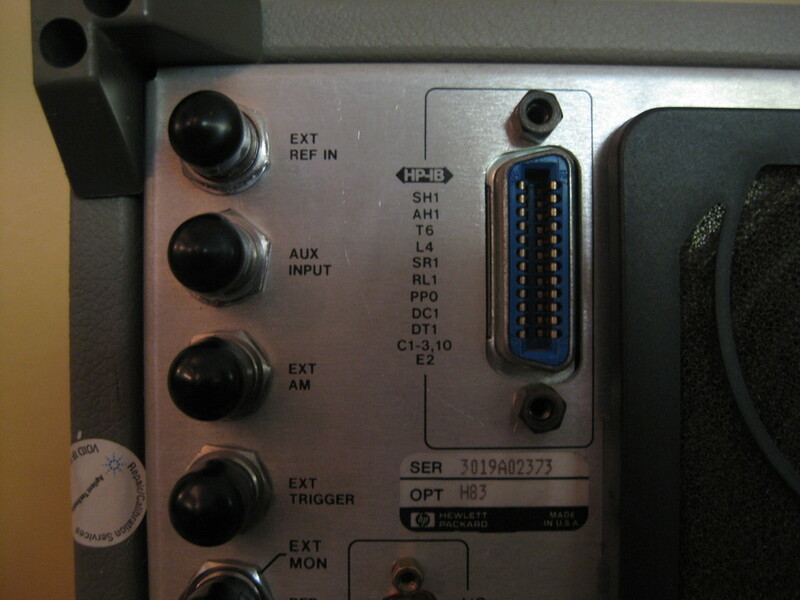 HP 8642B opt. 002 SIGNAL generator 100 KHz - 1057 MHz (like new) -image- 2000 in stock . 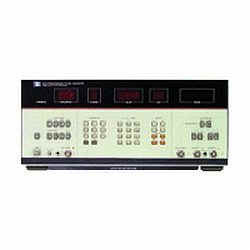 HP 8654A SIGNAL Generator 10-520 MHz 350 . .
HP 8656B Synthesized signal generator. 100 KHz to 990 MHz. 1599 1 DD5 . HP 8657B Synthesized signal generator. 100 KHz to 2060 MHz. -image- 1550 1 . 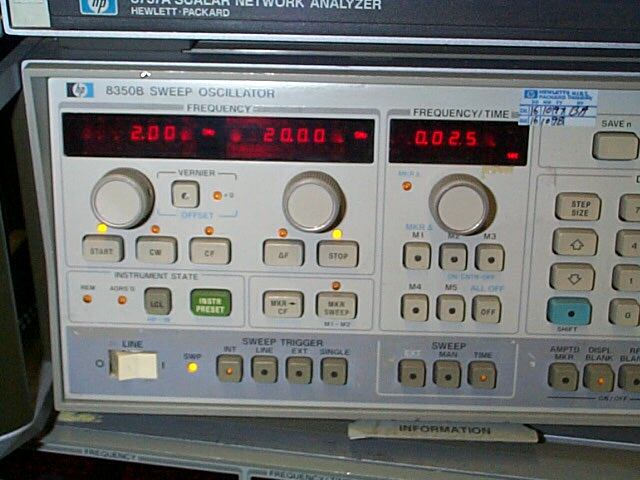 HP 8657B opts 002, 003 Synthesized signal generator. 100 KHz to 2060 MHz. 1950 DD5 . HP 8660C synthesizer mainframe call .sold . HP 8660C opts 011, 005, 100 10 KHz - 2.6 GHz Synthesized Generator Mainframe, 1 - 2 Hz resolution, 10-digit display, 140 dB calibrated range, AM, FM, OM, and pulse modulation with internal 11661B range extension module (opt.100), 3x10e-9/day reference oscillator (opt.001), HP-IB (opt.005) 995 sold . HP 86601A .01-110 MHz rf section 250 hpvm1p6 D5 . HP 86603A 1-2600 MHz rf section 699 hpvm1p6 D5 . HP 86603A opt 002 1-2600 MHz rf section phase modulation 1089 DD5 in stock now . HP 86631B auxiliary plug-in 100 hpvm1p5 . HP 86632B plug-in call hpvm1p6 . HP 86634A modulation section call hpvm1p6 . HP 86635A modulation section call hpvm1p6 . HP 8671B 2 - 18 GHz synthesizer sold . .
HP 8673B 2 - 26 GHz synthesizer sold sold . HP 8683B 2.3 - 6.5 GHz synthesizer sold sold . HP 8690B SWEEP Generator *call for avail. * *call .sold . HP 8692B 1.7-4.2 GHz plug-in * *250 .sold . HP 8694B 7 - 12.4 GHz plug-in * *250 sold . HP 8695B 12 - 18 GHz plug-in * *250 sold . HP 8696A 18 - 26 GHz plug-in * *call sold . HP 8699B 0.1-4 GHz plug-in * *250 sold . HP 85 computer as-is 199 . .
HP 86B computer 450 tested OK .
HP 87 computer 350 . .
HP 8743B opt 018 reflection transmission test unit 750 2 ea. .
HP 8750A STORAGE Normalizer (we have several of the board options avail. also) 250 . .
HP 8755A scalar plug-in...as-is 100 sold . HP 8755C scalar plug-in... 175 sold . HP 8756A scalar network analyzer 625 1+ in stock refurb. HP 8756A COLOR LCD scalar network analyzer 999 in stock refurb. HP 8757C scalar network analyzer -image- 2250 in stock now! Refurbished . HP 8757C 001 scalar network analyzer 2950 in stock now! Refurbished . HP 8757D 001 scalar network analyzer call bench . HP 876* series switches RF Switches have moved -here- call . .
HP 8900D peak power meter 750 2 . HP 8970A Noise figure meter (1600 MHz) 1500 1 . HP 8970B opt H18 8970B 18 GHz noise figure meter 2850 available now! . HP 8970S 8970B & 8971C 002 noise figure test system -image- 12,000 . HP 9000-300 cpu 500 . .
HP 911C 3.5 mm sliding load kit in box image -picture- 475 2 ea. .
HP 9111A graphics tablet 150 1 . HP 9121D dual fdd HPIB (add $25 packing fee) 175 edb CALL FOR AVAILABILTY . HP 9122C dual 1.44 fdd HPIB (call for availability) 475 edb CALL FOR AVAILABILTY . HP 9122D dual fdd HPIB (*=refurb. w/ 30 day domestic warranty. Plus $25 USA packing fee, exports are higher) 250 edb CALL FOR AVAILABILTY . HP 9133D 15 mb hdd, fdd HPIB (* see note above) 275 edb CALL FOR AVAILABILTY . HP 9133H 20 mb hdd, fdd HPIB (* see note above) 350 edb CALL FOR AVAILABILTY . HP 9134D 15 mb hdd, HPIB (* see note above) 250 edb CALL FOR AVAILABILTY . HP 9134H 20 mb hdd, HPIB (* see note above) 300 edb CALL FOR AVAILABILTY . HP 9153A 10mb hdd, fdd HPIB (* see note above) 300 edb CALL FOR AVAILABILTY . HP 92220R short GPIB cable w/ right angle con. 40 . .
HP 92267A WAND 25 . .
HP 93550A opt 500 hp93550-60104 48 pin Switch (+qty. with holders) -picture- call . .
hp E1301B HP75000 series B mainframe w/ keyboard & display call 0ffice . hp E1400B 75000 series C High power VXI mainframe 800 . .
hp E1401A High power VXI mainframe 800 . .
hp E1401B High power VXI mainframe 1000 . .
hp E1402A VXI Extender Card 699 hpvm1d4 . hp E1403A A/B-SIZE adapter 250 VXI-5 . bench (call for availability) . 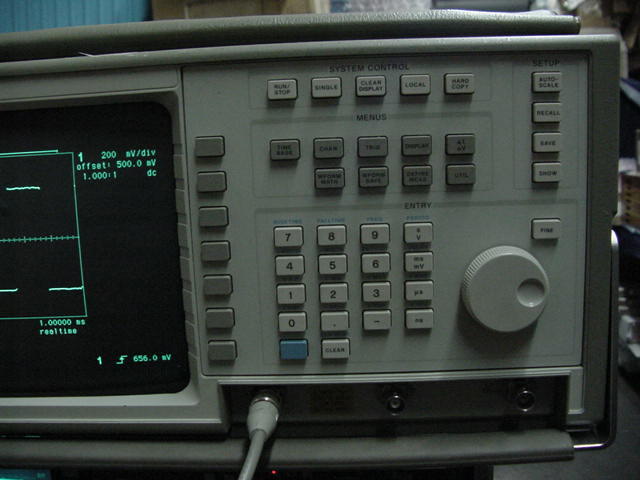 hp E1428A HP75000 series C VXI Digitizing Oscilloscope 1GSa/s 250 MHz 4949 hpvm1d4 . hp E1430A HP75000 series C VXI 1949 hpvmtop . hp E1445A E1445-69201 arbitrary function generator -data- 2249 hpvm1d4 . hp E1460-66502 board only, no cover call VXI-5 . hp E1474A six 1X4 75 ohm RF Multiplexer 849 hpvm1d2 . hp E1475A six 1X4 75 ohm RF Multiplexer expander VXI 550 VXI-5 . hp E1482B VX1-MX1 HP75000 interface module 649 hpvm1d4 . hp E3249B opt 012 system disk and dat module (no HD) 2499 hpvm1d9 . 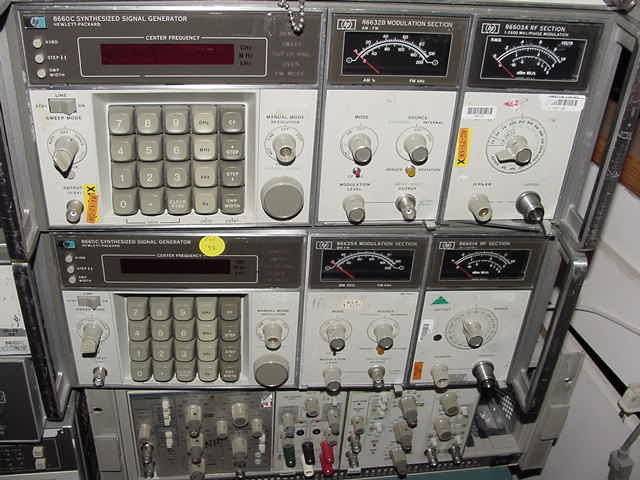 hp E4480A Cerjac 156 MTS sonet maintenance test set PARTS UNIT .SOLD . 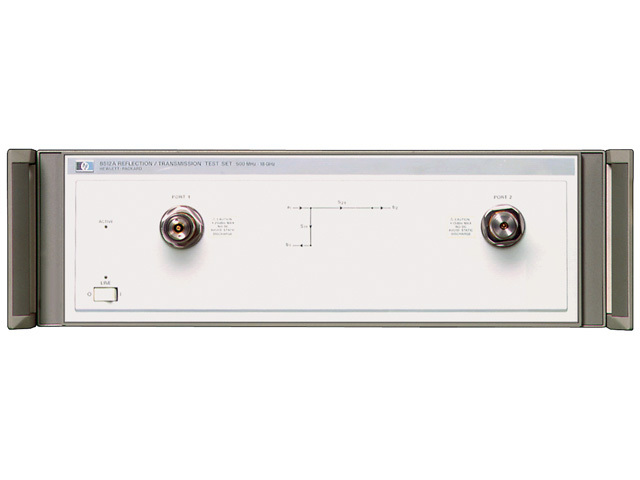 hp K03 103AR 100 KHz distribution amplifiers call ctn . HP waveguide components click -here- for waveguide . . .